School of Medical Sciences, Edith Cowan University, Western Australia 6009, Australia. Citation: Martins IJ. Evaluation of diagnostic tests in human health and disease. J Clin Path Lab Med. 2018;2(1):13-15. Evaluation of diagnostic tests and biomedical data that have promised detection of early disease progression have raised concerns with under-diagnosis of various chronic diseases associated with the prevalence of various global chronic diseases. Diagnostic tests and plasma analyte analysis do not determine nuclear-mitochondria defects with discoveries in clinical eipgenetics that identify the gene Sirtuin 1 to be defective and to be involved in toxic immune reactions relevant to mitophagy. Proteome blood analysis is now an important diagnostic procedure in medicine with existing proteomic biomarkers correlated with early disease progression in health and disease. Sirtuin 1 analysis in plasma and body fluids is essential to determine the importance of diagnostic clinical biochemisty tests and will allow early diagnosis of disease progression that involves cardiovascular disease, non alcoholic fatty liver disease, metabolic disease and neurodegenerative diseases. Clinical chemistry, Tests, Public health, Diagnosis, Analytes, Plasma, Diabetes, Mitophagy, NAFLD, Sirtuin 1, Epigenetic. Clinical chemistry in public health care has become of considerable importance to the global community and is now a multibillion dollar industry. Substantial progress has been made over the past 40 years in clinical chemistry with relevance to various plasma/serum diagnostic tests and plasma/serum analytes (Figure 1) in the diagnosis and evaluation of various chronic diseases such as non alcoholic fatty liver disease (NAFLD), cardiovascular disease, obesity, diabetes and neurodegenerative diseases. Several advances in machine learning  has led to analysis of high-dimensional and multimodal biomedical data that have promised improvement in the detection, diagnosis, and therapeutic monitoring of early disease progression . Physicians have raised concerns for the prevalence of underdiagnosis  of various chronic diseases associated with the acceleration of programmed cell death in global diabetes and organ disease . Figure 1: Mitophagy exists as a major concern. 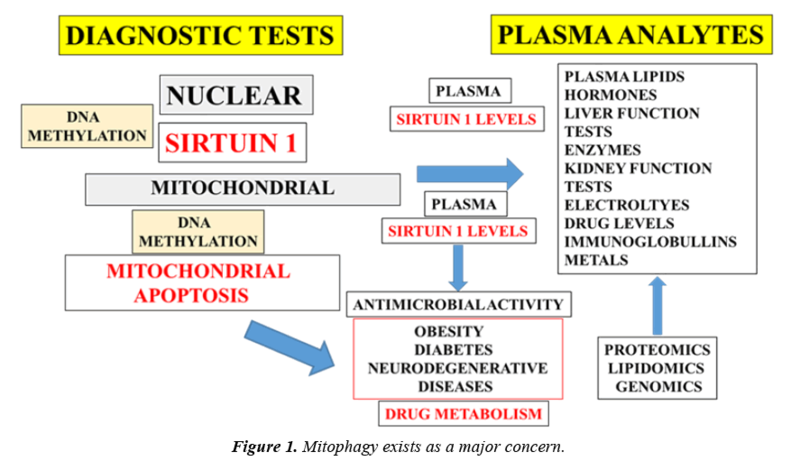 Mitophagy exists as a major concern (Figure 1) with relevance to chronic diseases in spite of various plasma/serum clinical chemistry tests that may provide early diagnosis for the nature of disease. In health and disease mitochondrial apoptosis [5,6] is now responsible for apoptotic and necrotic death in various tissues. Analysis of plasma lipids, hormones, electrolytes (kidney function), enzymes (liver function) and immune tests have failed to prevent mitochondrial apoptosis relevant to various chronic diseases. Mitophagy in NAFLD, metabolic diseases (obesity/ diabetes) and neurodegenerative diseases  with relevance to maintaining mitochondrial quality control and homeostasis has become a major criticism of clinical biochemistry detection (biomedical data). Monitoring of early disease progression by diagnostic tests is not connected to dysfunctional mitochondria and mitochondrial mass in cells and diseased tissues in global populations. Discoveries in medicine now identify the role of the heat shock gene Sirtuin 1 (Sirt 1) to be involved in toxic immune reactions, antimicrobial activity and mitophagy [8- 10]. The nuclear receptor Sirt 1 is an NAD(+) dependent class III histone deacetylase protein that targets transcription factors to adapt gene expression to metabolic activity, insulin resistance, inflammation is the defective gene that determines mitochondrial survival in various chronic diseases [11-14]. Interactions between Sirt 1 and other anti-aging genes such as Klotho, p66Shc (longevity protein) and Fork head box proteins (FOXO1/ FOXO3a) have been associated with mitochondrial apoptosis and accelerated aging linked to global diseases . The nuclear-mitochondria interaction  is important to cell survival in many tissues. Sirt 1’ regulation of the nuclearmitochondria interaction in cells is critical to prevent NAFLD with Sirt 1 repression involved in the induction of NAFLD and linked to obesity, diabetes and neurodegnenative diseases . DNA methylation is a key epigenetic process involved in the regulation of nuclear gene expression and mitochondrial gene expression with programmed aging. Sirt 1 and its regulation of the nuclear-mitochondria interaction is now relevant to DNA methylation [17,18] with Sirt 1 inactivation involved in defective nuclear and mitochondrial DNA methylation (Figure 1) with relevance to the epigenetic aging clock, immune reactions, mitophagy and disease associated aging/Alzheimer’s disease alterations [19-22]. Proteome blood clinical analysis is now an important diagnostic procedure in medicine with many existing proteomic biomarkers  possibly correlated with early disease progression in health and disease. Sirt 1 measurement in the plasma, cytoplasm and nucleus (Figure 1) is essential to determine mitochondrial apoptosis [24-27] when compared to the validity of various diagnostic tests and plasma analyte measurements [1-5]. Biomedical data that have promised detection of early disease progression have raised concerns with under-diagnosis of various chronic diseases associated with the increased prevalence of various global chronic diseases. Mitophagy is a major concern with relevance to chronic diseases in spite of various plasma/serum clinical chemistry tests that may provide early diagnosis for the nature of disease. In health and disease mitochondrial apoptosis is responsible for apoptotic and necrotic death in various tissues associated with cardiovascular disease, NAFLD, obesity, diabsetes and neurodegenerative diseases. Discoveries identify the heat shock gene Sirt 1 to be defective with toxic immune reactions that determine mitochondrial survival, mitophagy and mitochondrial apoptosis. Sirt 1 inactivation in various global chronic diseases require Sirt 1 plasma analysis to determine effective cell nuclear-mitochondria DNA methylation in various cells and tissues that is not evaluated by existing biomedical data from existing clinical biochemistry diagnostic tests. Sajda P. Machine learning for detection and diagnosis of disease. Annu Rev Biomed Eng. 2006;8:537-65. Martins IJ. Diabetes and organ dysfunction in the developing and developed. GJMR. 2015;15:15-21. Nieminen AL. Apoptosis and necrosis in health and disease: Role of mitochondria. Int Rev Cytol. 2003;224:29-55. Olson M, Kornbluth S. Mitochondria in apoptosis and human disease. Curr Mol Med. 2001;1:91-122. Um J-H, Yun J. Emerging role of mitophagy in human diseases and physiology. BMB Rep. 2017;50: 299-307. Martins IJ. Single Gene inactivation with implications to diabetes and multiple organ dysfunction syndrome. J Clin Epigenet. 2017;3: 1-8. Martins IJ. Antimicrobial activity inactivation and toxic immune reactions induce Epilepsy in human. J Med Discov. 2017;2:1-7. Martins IJ. Heat shock gene Sirtuin 1 regulates post-prandial lipid metabolism with relevance to nutrition and appetite regulation in diabetes. International Journal of Diabetes and Clinical Diagnosis. Int J Diab Clin Diagn. 2016;3:1-3. Martins IJ. Genomic medicine and management of genetic disorders. J Genet Disord. 2017;1:6. Martins IJ. Diet and nutrition reverse Type 3 diabetes and accelerated aging linked to global chronic diseases. J Diab Res Ther. 2016;2:1-6. Martins IJ. Insulin therapy inactivation is connected to NAFLD and diabetes severity index. J Diab Clin Stud. 2017;1:1-3. Martins IJ. Anti-aging genes improve appetite regulation and reverse cell senescence and apoptosis in global populations. AAR. 2016;5: 9-26. Martins IJ. Unhealthy nutrigenomic diets accelerate NAFLD and adiposity in global communities. Journal Molecular and Genetic Medicine. 2015;9:1-11. Van der Wijst MG, Rots MG. Mitochondrial epigenetics: An overlooked layer of regulation? Trends Genet. 2015;31:353-56. Zinovkina LA, Zinovkin RA. DNA methylation, mitochondria, and programmed aging. Biochemistry Mosc;. 2015;80:1571-57. Suarez-Alvarez B, Rodriguez RM, Fraga MF, et al. DNA methylation: A promising landscape for immune system-related diseases. Trends Genet. 2012;28:506-14. Teitella M, Richardsonb B. DNA methylation in the immune system. Clinical Immunology. 2003;109:2-5. Choi SW, Friso S. Epigenetics: A new bridge between nutrition and health. Adv Nutr. 2010;1:8-16. Geyer PE, Holdt LM, Teupser D, et al. Revisiting biomarker discovery by plasma proteomics. Mol Syst Biol. 2017;13:942. Martins IJ. The role of clinical proteomics, lipidomics, and genomics in the diagnosis of Alzheimer’s disease. Proteomes.2016;4:1-19. Martins IJ. The future of biomarkers tests and genomic medicine in global organ disease. Arch Infect Dis Ther. 2017;1: 1-6. Martins IJ. The limitations of food intake and biomarkers in the prevention of chronic diseases. Nov Tech Nutri Food Sci. 2017;1:1-3. Martins IJ. Biomarker tests and ageing science. Ageing Sci Ment Health Stud. 2017;1: 1-2. Martins IJ. Autoimmune disease and mitochondrial dysfunction in chronic diseases. Res Chron Dis. 2017;1:10-12.